This is what the proposed hybrid diesel-electric vessels will look like. Image courtesy of BC Ferries. NORTHERN VANCOUVER ISLAND, B.C. – BC Ferries is launching a new class of ferries in the next few years. The Island Class will service four routes and will be hybrid diesel-electric vessels. According to the project’s site page, the company aims to have the new ferries added to the fleet by 2020-2021. By 2020, there will be one new ferry each for the Powell River-Texada and Port McNeill-Alert Bay-Sointula routes. By 2021, there will be two ferries each for the Campbell River-Quadra Island and Nanaimo Harbour-Gabriola Island routes. The new Island Class ferries will each be able to carry 47 vehicles and up to 450 passengers and crew. Each ferry will be double-ended for easy loading and unloading, wide vehicle lanes, dedicated foot passenger paths, as well as space for bicycle parking. 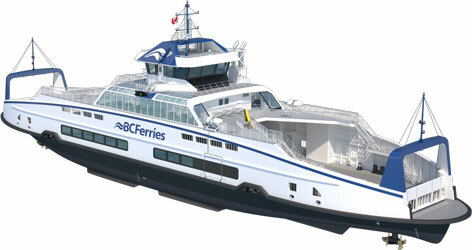 The new vessels will “utilize some of the most advanced clean marine technology in the world”, according to BC Ferries. The vessels will also have the capacity for full electric operation in the future. BC Ferries will be holding drop-in information sessions regarding the new project in spring for the Powell River-Texada and Port McNeill-Alert Bay-Sointula routes. Drop-in information sessions for the Campbell River-Quadra Island and Nanaimo-Gabriola Island routes will be held in the fall. BC Ferries is launching the new ferries as a result of community feedback, asking for more frequent sailings, increasing passenger and vehicle capacity on vessels, as well as reducing line-ups and congestion on local roads and terminals. According to the project’s site page, the old vessels will be retired and disposed of in an environmentally-conscious manner. The Quadra Queen II, which services the Port McNeill-Alert Bay-Sointula route, will serve as relief, filling in for other ships to allow retirement for older vessels.